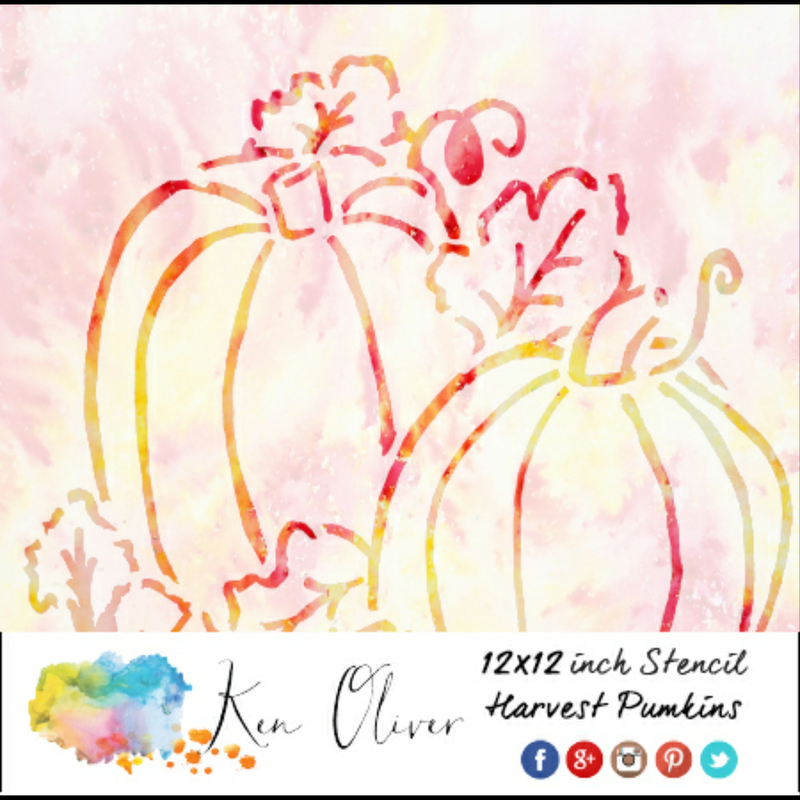 Hey everybody, Fall is finally here and no doubt your craft projects and art will be inspired by this wonderful season. 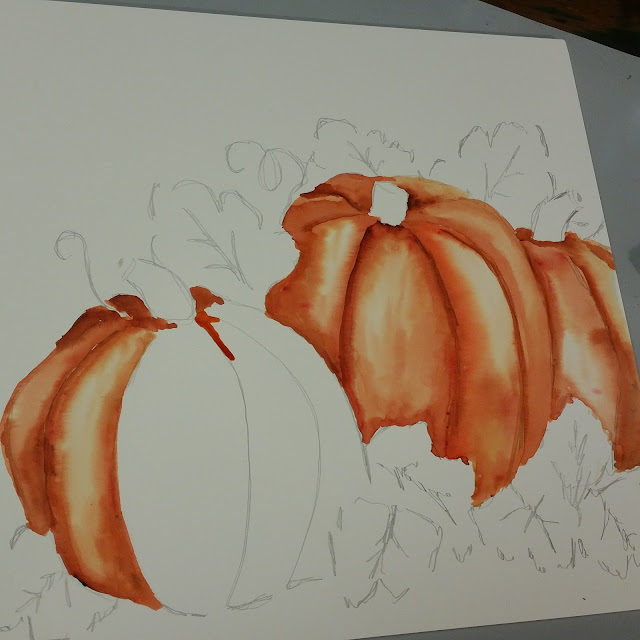 This is a watercolor painting project that I think you'll love. 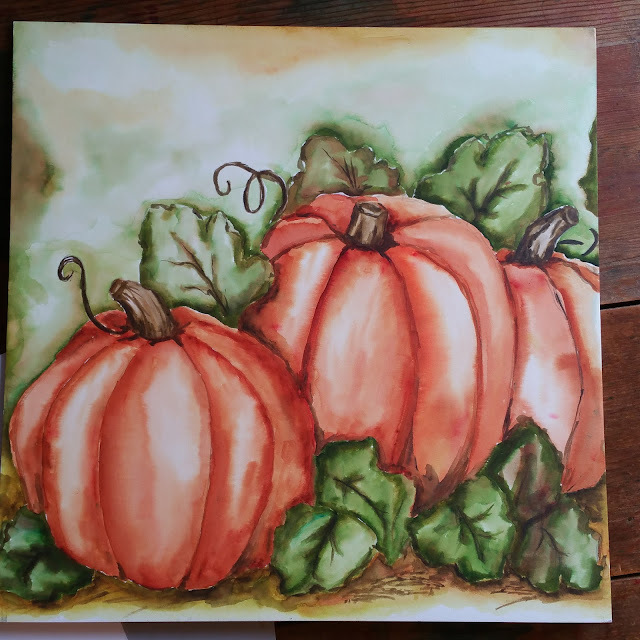 It's a pumpkin patch painting using one of my new 12"x12" stencils and Color Burst. 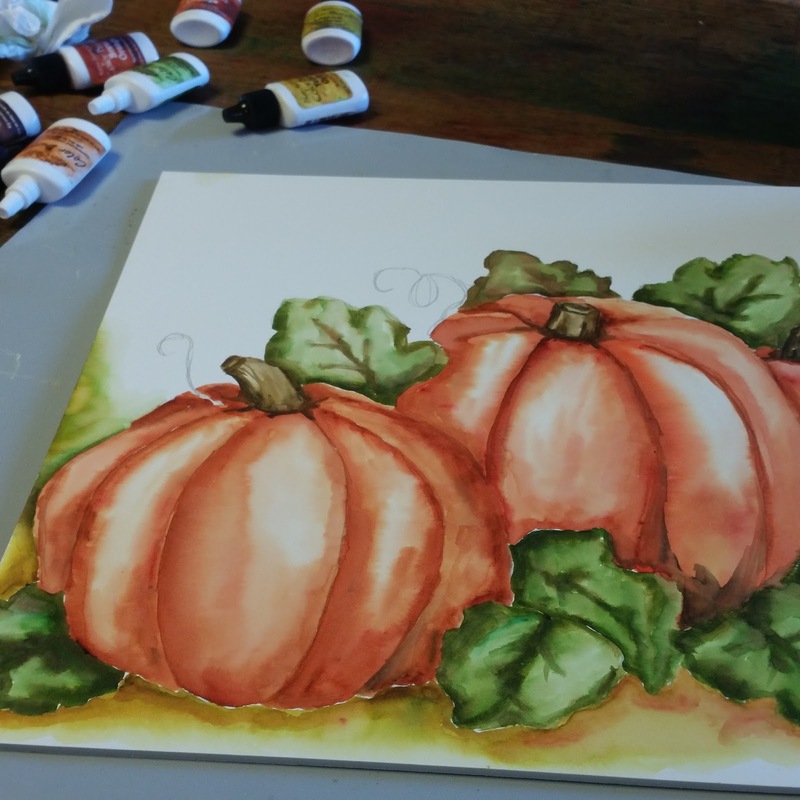 I chose a Color Burst palette that's perfect for fall...Yellow Ochre, Orange, Burnt Orange, Burnt Umber and Lamp Black. I love this color palette for fall...in fact, it's the first time that I've really focused on using Burnt Orange...the deep orange tone is wonderful! 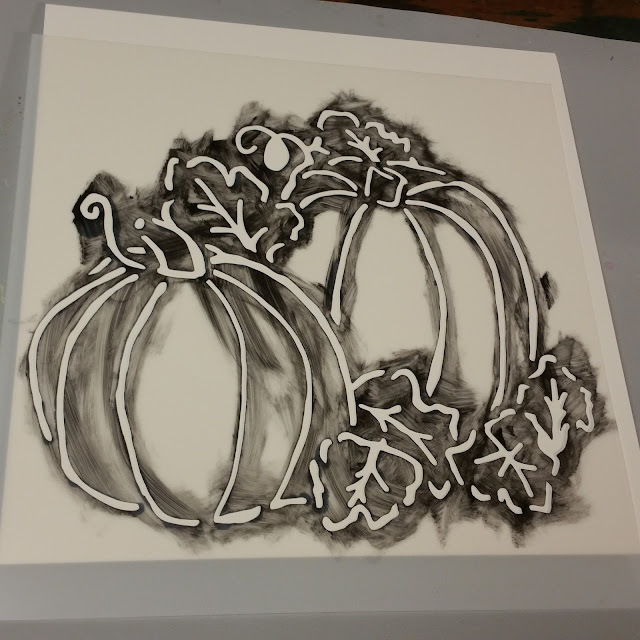 And, here's the new stencil I used. 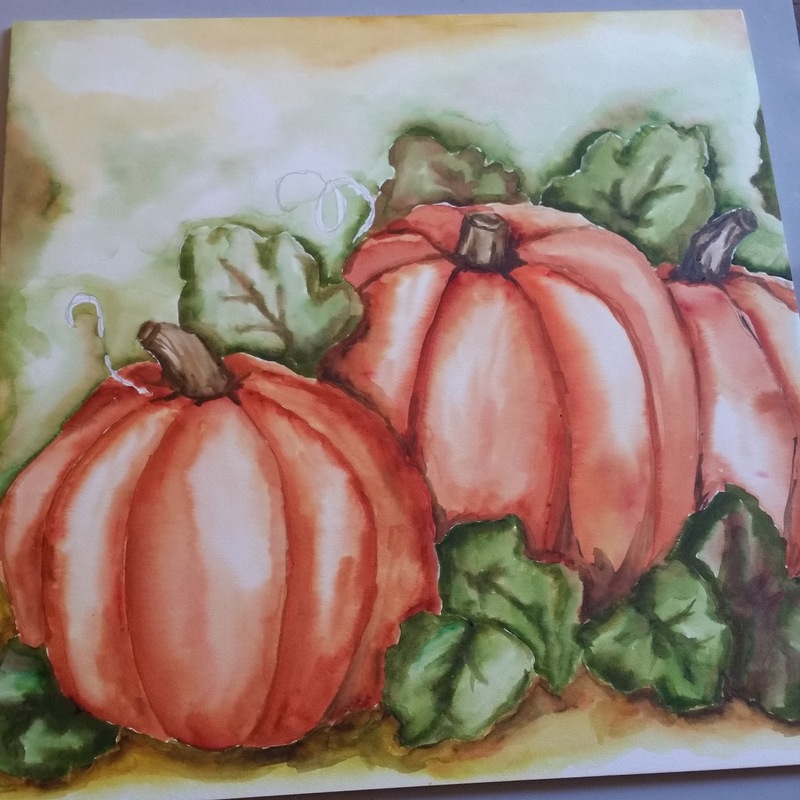 It's 12"x12" and called Harvest Pumpkins. To get started, I placed the stencil on top of one of my 12"x12" Mixed Media Art Boards, the front side of the board is covered with watercolor paper, so it's a great surface for this project. And, as you can see, I've already used this stencil with black ink, It actually helps you to see the stencil image in this photo. 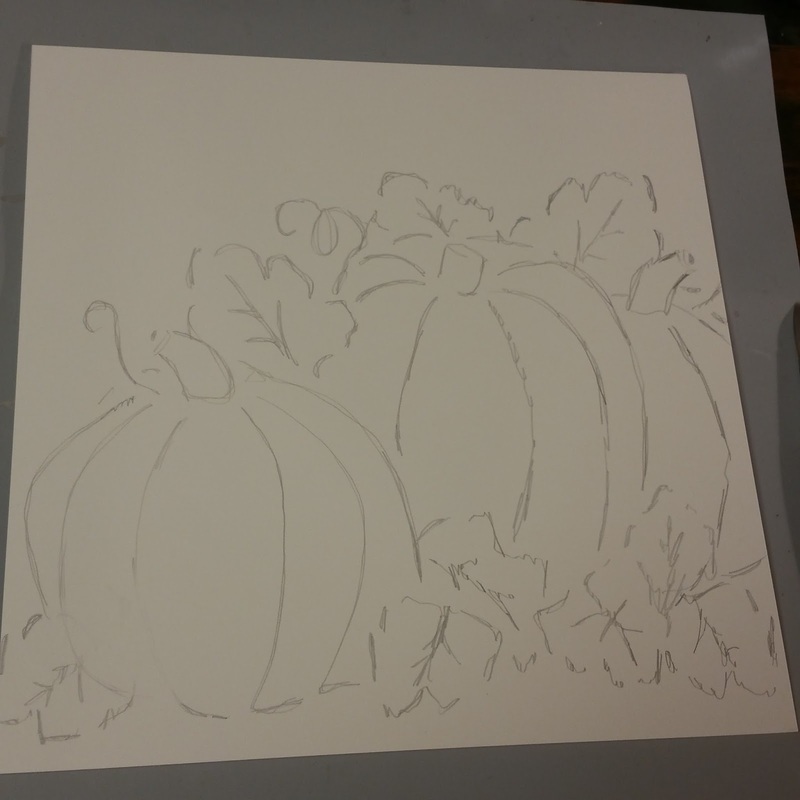 With the stencil in place, I used a pencil to trace the outline of the pumpkins, and if you'll notice, I used the stencil to add an additional pumpkin...I simply traced the 2 pumpkins in the foreground, and moved the stencil over to add an additional pumpkin in the background on the right side of the composition. Here's a tip, you do not have to "draw" this image with any exact precision...in fact, I just kind of scribbled through the stencil to create my "drawing." Then, I started to paint the image with Color Burst Burnt Orange and water. You may have seen Color Burst sprinkled and spritzed...painting with Color Burst is a little different. 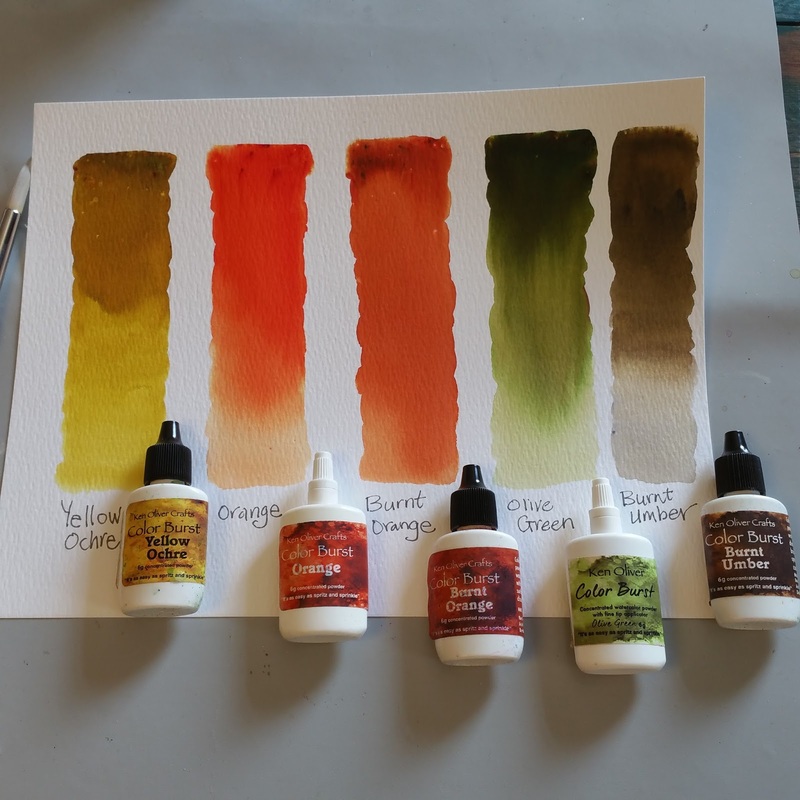 Tap out a bit of Color Burst powder into a paint palette, then pick up the pigment with a wet brush and begin painting and blending. From here on out, it's like paint by numbers, I completed the painting by filling in little sections, until each section was painted. It's cool to watch it all come together. And then, used Color Burst Olive Green to paint the leaves. To paint the background, I create a muted wash with Yellow Ochre, Olive Green, and Burnt Umber. 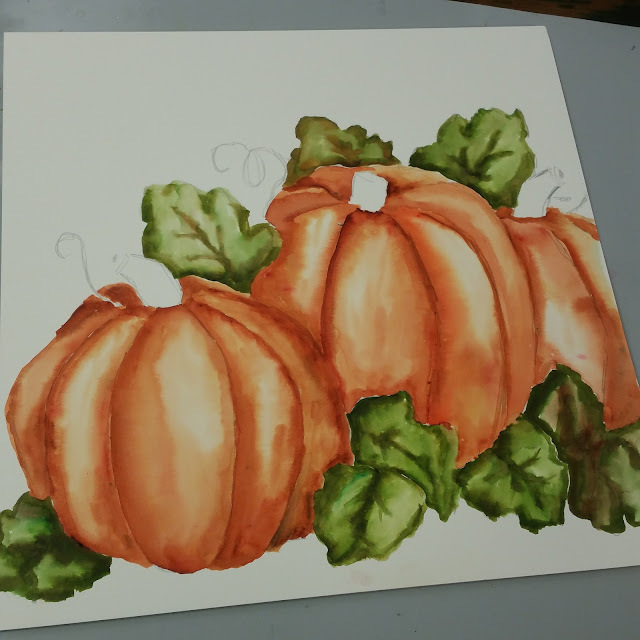 And filled in the remaining areas with a subtle watercolor wash. You'll notice, I left the tendrils blank until the watercolor wash background was complete. 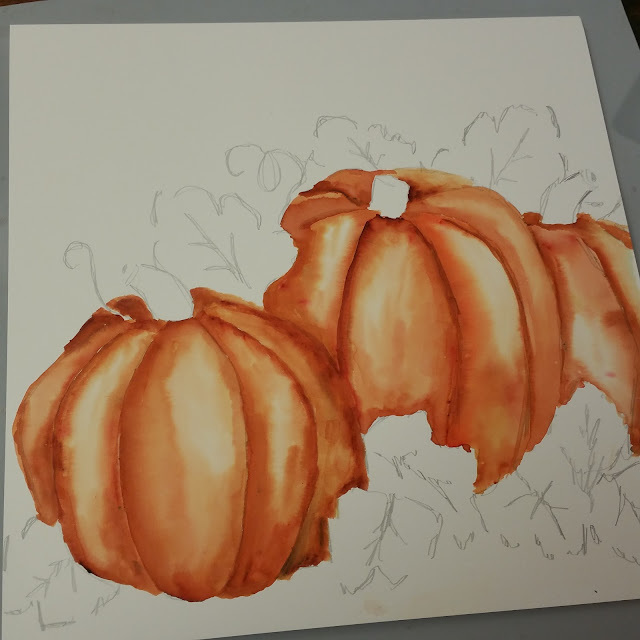 It's easier to paint them on top of the background rather than to paint around them. some "straw" in the foreground with Burnt Umber. 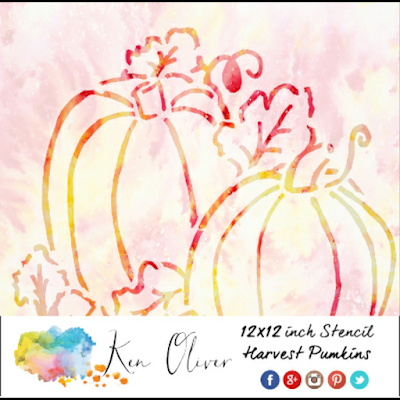 Ken Oliver Crafts Mixed Media Art Board 12"x12"
Ken Oliver Crafts Harvest Pumpkin Stencil 12"x12"
I didn't include links to the projects...please ask your local retailer to order them for you or do a quick google search if you don't have a local retailer. You'll find lots of options. 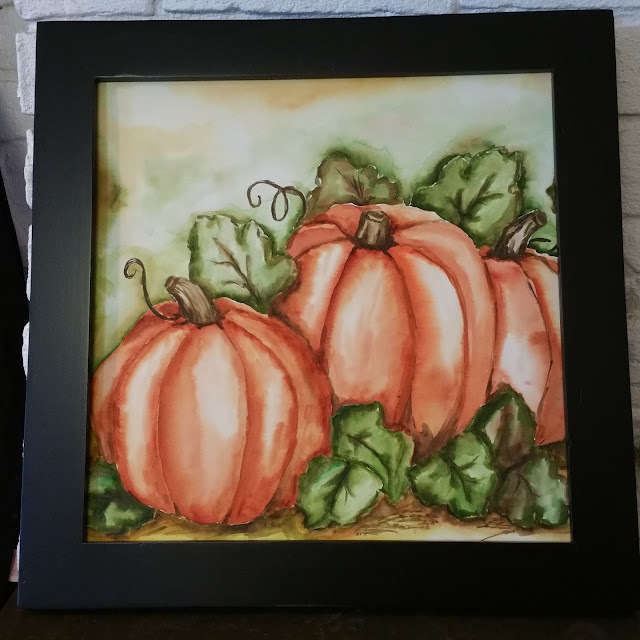 This little painting will look great in your home from now through Thanksgiving...and your friends will think you're a watercolor genius! Thank you again for stopping by today, I hope you've picked up a little inspiration and will try water coloring with Color Burst and stencils. This is a masterpiece of art Ken. I love it!!! Painting is an art and you are indeed a great artist! Haven't seen this type of painting before. It seems like you have brought real natural beauty to your painting! Hatsoff to you. Fabulous information great job, that you shared its so real and useful. 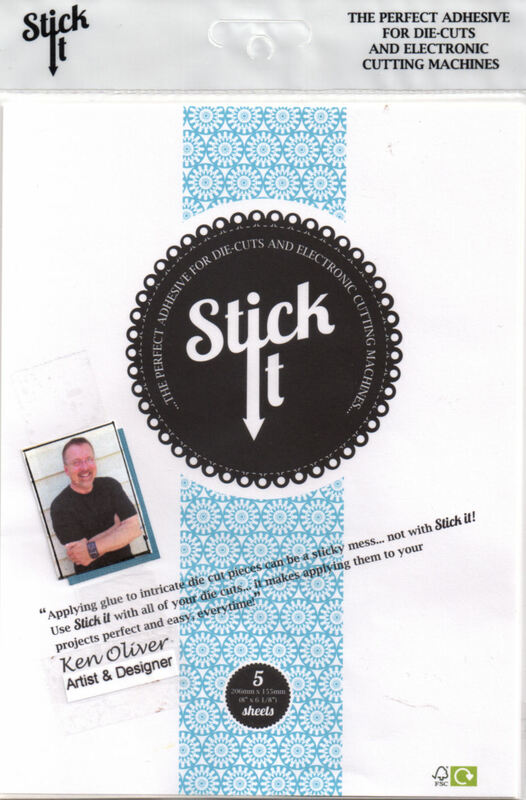 I like it, knowledge by blogging great idea.